Architects from the Gulf States Region of the American Institute of Architects gathered in Atlanta to celebrate the 2015 Honor Awards program. Seven projects were celebrated for their beautiful execution, interesting and thoughtful responses to site, and overall design excellence. Respected jury members chose these projects from those entered by architects practicing in the Gulf States region. 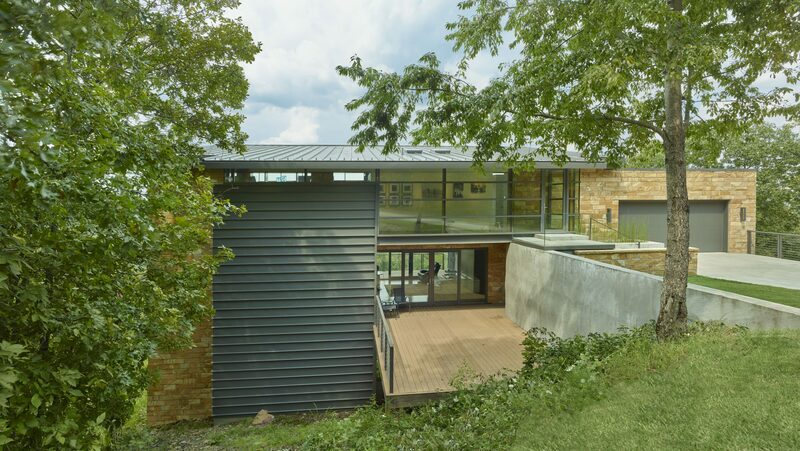 The Honor Awards program identifies built works of distinction, and strives to promote the excellent work by architects from Alabama, Arkansas, Louisiana, Mississippi and Tennessee. The accomplished group of design professionals from the Portland, OR area juried the projects. David Powell, AIA, of Hastings Architecture Associates in Nashville, TN acted as Program Chair. Jury Members included Amy Donohue, AIA, a principal with Boora Architects; Kyle Lommen, Allied Works; and Bill Neburka, AIA, principal at Works Partnership Architecture. Together, they reviewed and recognized seven projects from the 99 entered in the program; two of those seven being from Arkansas. On behalf of AIA Arkansas, congratulations to the below award recipients! Hillside Auditorium is sited between the historic Chi Omega Greek Theater and the Ferritor Hall and Science/Engineering buildings. Intended to recede into the landscape, Hillside Auditorium’s vegetated roofs allows the continuation of the natural topography across the site and maintains the prominence of the Greek Theater at the top of the hill. Along with the planted roofs, an efficient exterior envelope, and high-efficiency building systems, Hillside Auditorium will meet or exceed established energy use standards and continue the University’s sustainability efforts. This auditorium building replaced the Science and Engineering Auditorium to meet the University’s current need for large-capacity classroom spaces. There are two auditoria in the building – one seating 487 persons, and a second seating 290 persons. The building was to accommodate modest theatrical, spoken word, and musical performances and helps fill a niche not met by existing performance spaces found on campus. Intended to be the most visible portion of the building, an entrance and event pavilion, enclosed on three sides by high-efficiency glazing, is located on the uppermost-vegetated roof. The pavilion, which incorporates a catering kitchen, ample public seating, and gathering space, allows for expanded uses of the building and exterior spaces for special events. The Cantilever House is a pre-fabricated, affordable residence designed and built in Fayetteville, AR, by students, and then installed in the downtown Pettaway Park Neighborhood in Little Rock, AR. The house is composed of two modules. Module 1 (lower module) is 16′ x 32′ and contains the public spaces of the house: kitchen, living, dining, and a half bathroom. Module 2 (top module) is 16′ x 45′ and is stacked perpendicular to Module 1, cantilevering over the front and back porches. This module is the private spaces of the house: 2 bedrooms and one large bathroom. Stacking the two modules created the opportunity for a light well that connects the public to the private and is capped by a skylight. By rotating the modules perpendicular to each other, three exterior spaces are created—two porches covered by the cantilevers and a roof deck above the kitchen on top of the lower module. This extends the overall living square footage to the exterior. Two trusses 45′ long constructed of light gauge steel are the structure that supports the cantilevers. The north face of the top module reveals the trusses through translucent, polycarbonate material allowing ambient natural light in during the day, and then at night, it becomes a lantern that silhouettes the truss. Congratulate the team on the careful orchestration of simple forms and materials to create a rich spatial experience. Loved the skylight and translucent wall on the north side of the upper volume, both of which illuminate the space and give the sense of greater openness. This project demonstrated a sophisticated play of techtonics and function within the confines of a very simple architectural paradigm.